The Arizona Dive Shop is located in Barrio Barretto, Subic Bay Philippines. We are just a few minutes from the Subic Bay Free Zone and Olongapo City. 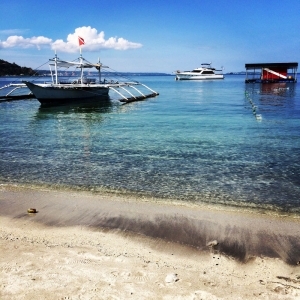 Our Subic Bay Dive Shop is part of the Arizona Resort which has 33 air conditioned rooms, the best food in the area, and a great view of the bay. Our Subic Bay Dive Shop is a full service PADI Instructor Development Center offering all PADI Dive Courses including the Instructor Development Course, Technical, Trimix, Sidemount and of course Recreational dive courses. We also offer Equipment Sales & Service and Repair, boat tours and commercial diving operations. We specialize in wreck diving along with technical diving and providing high quality PADI training programs. Our shop is open daily from 8am to 6pm and our boats leave at 9AM and 2PM each day for 2 dive trips. For all PADI divers, if you do not have your certification card or have lost it; not to worry, as we can look you up on the computer with your full name and birthdate. For other agencies please bring your certification card to verify proof of training. We meet at the dive shop at 8am for the morning trip and 1pm for the afternoon trip to complete necessary paperwork, equipment set up and leave by 9AM. The boat is back by 1pm, and heads back out at 2pm for the second trip. If you don’t have these items we do sell them in the shop. All dive trips include a complimentary hot snack, cold juice, coffee, drinking water and a hot towel to refresh after each dive. We also offer Nitrox up to 40% at a small additional charge to maximize dive times. If you complete your Nitrox training with us we offer FREE Nitrox for your whole stay. We have over 25 sets of AQUALUNG/APEKS/SUUNTO rental equipment meaning we can also accommodate larger groups. We also cater for the smallest and largest of divers. What we do very well is customer service. We take extra care to ensure all our guests enjoy their stay with us. Our team has members from the Philippines, Austrailia and Europe. We have decades of combined experience in the diving industry both in the Philippines and abroad. Jamie hails from South East London and began diving 20 years ago whilst traveling in Thailand. He got hooked on diving and decided soon after that a career as a dive educator was for him. Jamie became a PADI instructor in 2006 and has worked in Thailand, Malaysia, Jordan and the Philippines. He has certified over a 1000 students from Discover Scuba Diving right through to Tec Trimix and has won 5 PADI of Excellence awards for his teaching and in 2007 won the PADI Top Achiever award. In 2012 Jamie completed PADI Course Director training and is also a PADI TECREC Trimix Instructor Trainer. Kent originates from Australia and is a licensed Plumber with a background in Geotechnical Engineering and Site Management. Kent grew up outdoors and has always had a passion with anything revolved around the water with Scuba Diving being no exception. Kent visited Subic Bay in 2014 and caught the wreck diving bug immediately! Soon after a decision was made for a sea change and Kent moved to Subic Bay in March 2015 after purchasing the Arizona Dive Shop. Since moving to the Philippines Kent has concentrated on his thirst for Technical Diving. He thoroughly enjoys teaching all levels of technical diving from entry level, Advanced Wreck, and Technical Trimix Diving. Kent keeps himself abreast of the most modern diving practices and teaches accordingly. Technical diving is a rewarding sport when done properly and Kent doesn’t cut corners with customer safety or quality training. Kent is currently diving as much as possible on his Closed Circuit Rebreather in preparation for new and exciting projects! Originally from N. Ireland, Mike also lived in France for 10 years before moving to the Philippines 13 years ago and speaks fluent French. Mike started diving 16 years ago and quickly became addicted to the sport. He is now a PADI Gold level MSDT Instructor with 12 years of teaching experience. He is one of the most experienced instructors around Subic Bay and a confirmed wreck-diving addict. He spends time in Coron Palawan when he is not in Subic Bay at the Arizona Diveshop. From Essex in the UK, Shaun entered the dive industry in 2001 after having learned to dive in 1999. In the time that has passed, he has worked many roles in the industry – Owner and Manager of Dive Centers, full time dive technician, compressor mechanic, recreational & technical diving instructor as well as a surface supplied commercial diver. Having been heavily involved in the UK wreck diving scene and identification of unknown wrecks Shaun feels right at home in Subic Bay given the vast amount of quality wreck diving we have here with Arizona Dive Shop. Shaun enjoys teaching a wide variety of classes including several self-written PADI approved programs. Shaun is a top class equipment and compressor technician teaching PADI programs, his own PADI Distinctive Specialties and also for respected Australian agency TQS. Anyone thinking of undertaking a class in either of these fields should look Shaun up here at the Arizona Dive Shop. You won’t be disappointed. Leo is originally from Nueva Ecija and raised in Olongapo. He loves playing basketball, movies and the water of course. He started diving in the year 2015 and has worked hard to achieve the level of Divemaster. Leo is a certified APEKS and AQUALUNG equipment technician and has a unique ability to spot marine life that others pass by. Oland has been working with Arizona Dive Shop since 2015. Oland is a tireless worker and is our all rounder. He works as Dive Crew, Boat Captain and is a budding Divemaster. Oland works hard to ensure the safety of the divers and non-divers as well as dive equipment. Oland also has a great attention to detail. If you return after a long break he will remember your equipment size, weights required and have your kit in the crate ready to go when you arrive at the dive shop each morning. Penn was born and raised in Subic, Zambales. She is a graduate of Computer Programming at College of Subic Montessori. Penn has previously worked at Subic Ocean Adventure wherein she developed and progressed her excellent customer service skills. Penn is the real brains of the operation, managing the office and filling Nitrox tanks in her spare time. When not at work she is a loving mother to her daughter Samantha. Originally from Castillejos, Zambales, Gladys has a degree from Ramon Magsaysay Technological University in Hotel and Restaurant Management and has worked as part of the Arizona Dive Shop team since 2014.